LifeinLines is a newly launched startup that wants you to tell your life’s LiL (i.e LifeInLines) story. We have covered other players in this space (like LifeBlob, Dandelife etc), but what distinguishes LifeinLines is the simplistic UI and multi ways to share your life story. Apart from directly posting using the website, users can also share their life stories by sending LiL an email, a message from a Google Talk messenger, an sms or even record your voice by calling LiL from your phone. You can choose to keep an entry personal, or share with selected people by using LiL’s 5 layer privacy settings, add location tags, share your mood etc. The product, even though in closed beta has a good attention-to-detail calls and a pleasant interface. Having said that, I am not too sure whether this product will see a mass adoption unless it solves a serious pain or has super cool benefits. 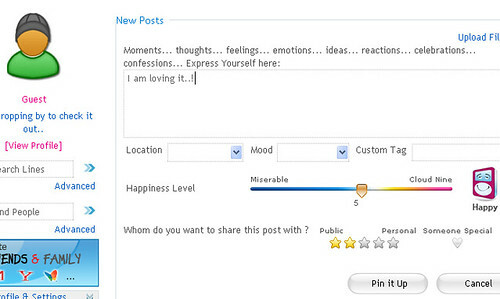 Personal blogging is by far the easiest way to share one’s life and LiL’s missing point seems to be the interactivity among users (which Twitter has really banked on). In the newly open world, it’s not about just my life, but also about other’s life. Seeding content is always a pain for a product like this and I recommend LiL to get their Orkut and FaceBook app asap, as that might help them test waters and measure the uptake. What’s your take on LiL? Will you use such a service?